An effective education system at all levels represents a key element of a sustainable society. That includes basic education for the entire populace, modern means of imparting know-how, and training for all age categories. Information technologies empower market participants and enable the implementation of new business models. At an ever-increasing pace, modern communication systems and the Internet are becoming the key to obtaining information and education. New business models in the fields of schooling and training. The internet and digitalization have fundamentally transformed information accessibility. This development has great implications for education and generating knowledge across the world. Depicted in the graph is the evolution of access to internet in developed and developing countries. 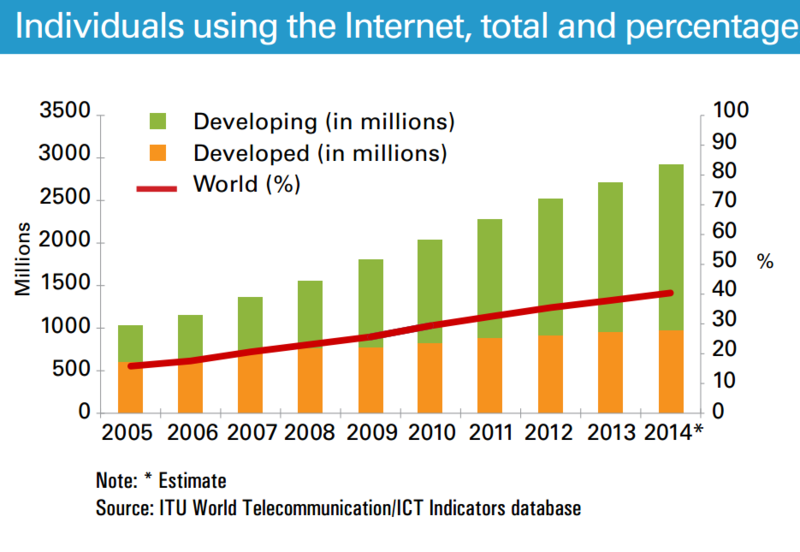 Within the last 10 years, the number of people with access to the internet has almost tripled. Today, two thirds of internet users are from the developing world. Around 40% of the world‘s population now has access to the internet, which still implies a large potential for growth. Globally, there are 4 billion people not yet using the Internet and more than 90% of them are from the developing world. Information and communication technologies (ICT’s) are a key factor in access to information and knowledge. They provide people with the opportunity to access independent media, educational sites, social media and financial services. They also change the way businesses operate and coordinate their efforts. ICT’s are increasingly used in education. Through podcasts, webinars and online courses, knowledge can be transferred online. Teachers and students alike gain access to state of the art educational material on a daily basis. At the same time these technologies have opened a whole new realm of criminal activities against which ICT-users must be protected. Providing ICT services can be a very profitable business with huge economic potential. This has been proven time and again by the rise of ICT and internet giants. At the same time a phrase popularized by Stan Lee applies here: with great power comes great responsibility. While providing access to information and knowledge is of huge value, data protection (privacy) and security issues are often cause of concern and debate. The same is true for hardware-manufacturing where material input and labour standards have been known issues in the past. ICT companies addressing these issues actively are less likely to face legal issues and customer distrust in the long-term. 78% of global mobile-cellular subscriptions are estimated to be held by people in the developing world today. 9 basic patterns can describe 92% of 100,000 security incidents studied in the 2014 Verizon data breach investigations report. In sub-Saharan countries, 4 out of 10 children starting school, eventually drop out of the educational system. Globalance Bank considers various publications by Transparency International when investigating Footprints in Market and Infrastructure. In addition to the CPI, Transparency International also publishes the so called „ Bribe Payers Index (BPI)“, which investigates corporate behaviour of different companies when competing for contracts in various countries. Publications from the World Bank‘s „World Wide Governance Indicators Project“ are an additional source of valuable information.